(VOVWORLD) -China and North Korea have discussed strengthening exchanges and strategic cooperation in diplomatic affairs to boost friendly relations to a level that matches the intentions of their top leaders. 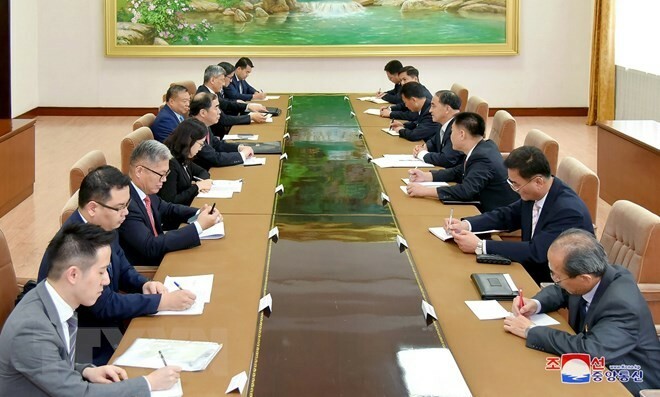 Talks were held on Wednesday in Pyongyang between Ri Kil Song, North Korea’s vice foreign minister, and Kong Xuanyou, China’s vice foreign minister and Special Envoy on the North Korean issues. South Korea’s Foreign Minister Kang Kyung-wha said Wednesday that there is a possibility of declaring an end to the Korean War at a UN meeting in New York this autumn. Kang said such an announcement would be a “political declaration” aimed at encouraging the North’s denuclearization process.